Check out the PAT Gallery pages from the side bar menu.. 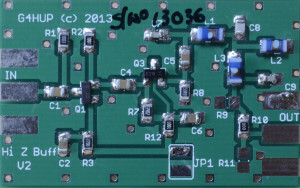 This circuit, which was presented as an entry level SMD construction project at the 2013 RSGB Convention, allows the IF of a rig to be tapped off at high impedance, and brought out to an external SDR, to give a panoramic display. See also the Radcom November 2014 Technical Feature article on the PAT board and its applications. This article is reproduced with the permission of the RSGB. 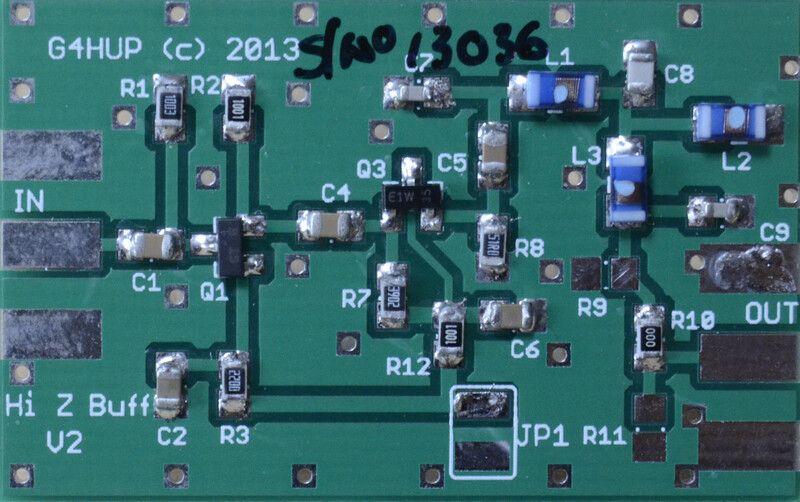 The PCB is just 40 x 25mm (approx 1.6″ x 1″), and fits nicely in an FT817. In larger rigs it can easily be ‘lost’ in a dark corner! 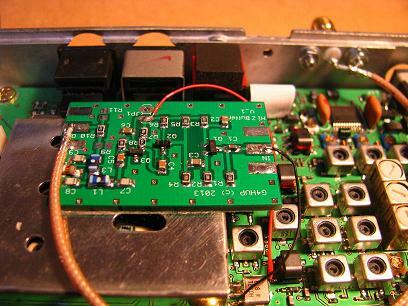 In addition to the high input impedance buffer, the PCB also provides for a low pass filter and an output attenuator. Both kits and assembled units are available – please go to the Orders & Prices page. There are many on the market, and most are compatible with more that one software package. Based on availability, economics and performance, hupRF recommends the SDRplay range as suitable SDR’s for use with PAT boards. Click on the link below to go to theSDRplay website – SDRuno software is also downloadable from the site. You can also look at this file, which is in Rig order. Instructions for installation for the rigs below may help you find the right points in your rig, even if it’s not listed. There are no notes provided for the FT857, but since it is essentially the same radio as the FT897, the connection points are the same. The only difference is that the output is brought out on a flying lead – included in the GPIK installation kit. In addition to the Notes links below, there is also a Gallery of installation picture details, including images from rigs for which there are no formal notes. Although some of the documents below, and the pictures you will see, show a coax connection from the rig into the PAT board, I recommend that you use a short length of fine single wire (eg wire-wrap type or similar), as this will have a lower capacitive loading on any tuned circuits that may be affected by the tap. The PAT board should be located as close as possible to the tap point, preferably within 50mm. TMP cables are now also available for those rigs that need them. Generic Socket kit – contains 400mm RG178, SMA two hole panel mounting socket, 6mm and 12mm M2.5 screws/nuts/washers, solder tag, red & black wire and double sided tape. Generic Plug kit – contains 400mm RG178 with crimped on SMA plug, double sided tape, red and black power wires, solder tag. TS2k kit – contains 400mm RG178, solder tag, red & black wire and double sided tape. This kit assumes that you will use the existing HFRx RCA socket as the IF out. If you don’t want to do this then order the GSIK or GPIK as appropriate. In addition to giving you a panoramic display centred on your Rx tuning, the PAT can also be used to give a wider view as an independent second Rx. The input signal for the PAT needs to be picked up before the 1st mixer, and your SDR must be tuned to the frequency/band you are receiving, instead of the IF frequency of your radio. 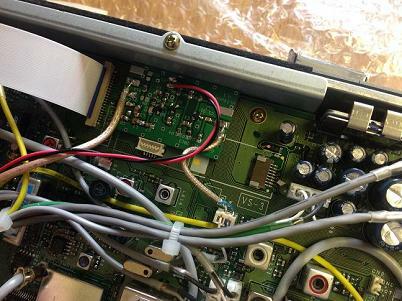 Operation is different, in that the SDR display will no longer change as you tune the band – it will remain fixed, and you can demodulate any signal seen on the SDR. 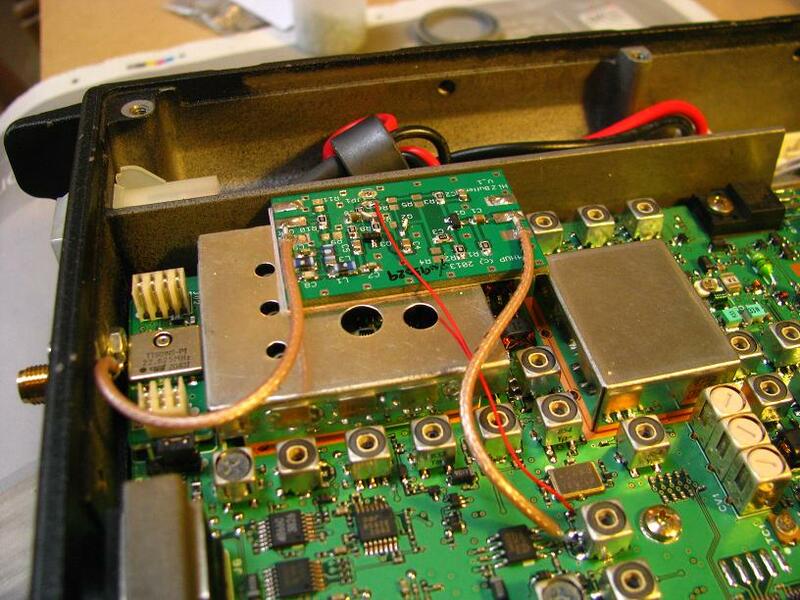 Of course, if you wish to work a station, then you must net your Tx with the SDR Rx! See pictures below of 2nd Rx operation. IF tap – 40 to 60kHz view around your tuned frequency. Once set to the rig IF, the SDR does not need to be adjusted. 2nd Rx – as wide a view as your SDR will allow. SDR must be adjusted each time you change band. This version has no LPF installed, so I’ve called it the Vanilla version! It is therefore ideally suited to 2nd Rx functions on radios which have VHF and UHF bands on them, such as the Yaesu 817/847/857 and 897 series. These radios all use a common 1st IF, which means that picking up the tap point just before the first mixer gives you access to the RF signal on all bands that the radio covers. This is more difficult on those radios that do not use a common 1st IF, such as the Kenwood and Icom all band offerings. These two new models allow direct connection of the output of your transverter to your external SDR, so for VHF and above users there is no need to go inside your favourite rig! Simply connect the PAT 30M or PAT146M in parallel with your IF receiver input, and see what is happening on your SDR. Kits and built units now available. DisclaimerTo install this board, you need to open up your radio and make connections to the signal path and power supplies. You also need to either install a connector or route a cable out through the rear panel. This may invalidate any warranty on your radio, and no liability is accepted by hupRF for any damage caused while installing or operating this product in your rig. Installation instructions and notes are provided to the best of my knowledge and in good faith.Similarly, hupRF accepts no responsibility for the methods or workmanship shown in any customer pictures posted to help you.